If you have ever come home to a scene like the one above, you probably experienced several different emotions including shock, anger, sadness and frustration with your dog. Yet in your dog’s mind, he did nothing wrong. He was just doing what dog’s do, and for some that includes chewing. He probably thinks you should be proud of him. After all, you didn’t really like the couch that much anyway, right? Most dogs like to chew a lot, but it does vary by breed and personality. My dogs’ habits varied. J’Maul was a bit of a chewer, but Annikka rarely chewed on anything other than her squeaky toys. However, my youngest dog, Isabella, was a ravenous chewer. Shoes, slippers, remotes, DVDs, and furniture all fell victim to her rampage. It was overwhelming. As bad as she was, I have friends whose dogs chewed through doors, recliners and entire rooms of furniture (like the above picture). I have observed those scenes in sheer awe and wonderment, coupled with a huge sense of relief that none of my dogs have ever done THAT much damage. Chewing can be a serious issue for the dog and the owner. Destructive behavior is one of the main reasons dogs are relinquished to shelters. It can also lead to serious medical problems and costly veterinarian visits. Therefore, to keep their sanity and their puppy, pet parents should be ready with solutions to correct this behavior before it gets out of hand. We know some of the reasons why puppies and dogs chew including teething, boredom, anxious and curiosity. After a dog has ruined your favorite pair of running shoes or your family heirloom coffee table, you are probably ready to solve the problem. To create new habits, you have to manage your pet’s environment to help her make better choices. Only allow a dog free time in your home when you are there to re-direct her chewing to the right type of things. Start by simply keeping the dog in the same room as you and continuously focusing her on chewing the correct items. Crate your dog when you are away, and consider leashing her to your leg when you are at home. This keeps her close by and makes redirecting her behavior easier. Stock up on toys that are appropriate. Many of today’s toys are also great training tools, food dispensers and can keep them occupied for hours. 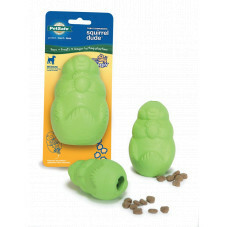 Squirrel Dude – This is shaped like a squirrel, and may be filled with kibble, treats, cheese, peanut butter, or whatever your dog enjoys. They can spend hours licking the toy to get the goodies inside. In the summer, I will fill with kibble and low sodium chicken broth and freeze it. This is J’Maul’s favorite summer treat. Magic Mushroom – Mental exercise is just as important as physical exercise. Most dogs will spend hours trying to get the treats out of the toy. You may even fill the mushroom with kibble and let your dog really work for her food. The more time they spend playing with this toy, the fewer hours he will spend eating your shoes or remotes. There is a whole line of products available that drop treats on the floor when manipulated in a certain fashioned. To be fair, not every dog is going to understand how the toy works or may not really be excited about the new toy. You may need to work with her or embellish the toy to pique her interest. 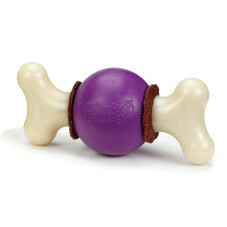 Last year, I purchased a toy called Bouncy Bone. Initially, my dogs were not excited about it. Then, I started soaking the it in chicken broth for an hour a day for a week. My dogs totally changed their tune, and the game was on anytime I brought it into the room. I make it a point to play with my dogs and with their toys every chance I have. This is especially important with a puppy. Give her a safe chew toy whenever you greet her. If you catch her chewing on a shoe or something else inappropriate, distract her away from it and give her the toy again. Praise her whenever you see her chewing the toy. Over time, you will find her habits change and she will spend more of her chewing time on it. The more she chews the right things the less she will chew the wrong ones. It was a process, but I was able to redirect Isabella’s chewing addiction with patience and consistency. Be realistic in your expectations. Puppies are going to chew, and so will some dogs. They key is to manage what they chew and your ability to monitor them while they are developing. As Director of Animal Welfare Studies and Education, Dean provides education on the proper use and benefits of PetSafe products to legislators and pet owners worldwide. In 2005, Dean volunteered for two weeks with The Humane Society of The United States and worked on the rescue efforts in the aftermath of Hurricanes Katrina and Rita. With military training as a survival and decontamination instructor, animal shelter background, and large animal handling experience, his skills were utilized in the disaster region. After Katrina, he was hired as the Ohio State Director for The HSUS. In that role, he not only worked with legislators on policy change, but he continued his hands on approach to assist with animal abuse/ neglect cases, rescue during natural and man- made disasters. He has also worked with law enforcement on several animal fighting raids and advocated for animal welfare reform. Most recently, he worked with Sumter-Disaster Animal Response Team assisting with oiled bird recovery and release. Dean has conducted trainings, written articles and given speeches on animal welfare, rescue and advocacy issues throughout the United States for diverse audiences and media outlets, including: Discovery Channel, CNN, Animal Care Expo, IACP and NACA. His position with Radio Systems Corporation has allowed him to remain involved in national and international animal welfare issues. Dean is a graduate from The Ohio State University with a degree in History and Political Science. He lives in Knoxville with his 3 rescue dogs, Annikka, J’Maul and Isabella.